These stuffed broiled mussels are a simple and easy appetizer made with steamed mussels in white wine topped with bread crumbs, parsley, garlic, and olive oil and then broiled until golden. 1. In a large pot, combine the wine, water, onion, parsley stems, and bay leaf. Cover and bring to a boil over medium heat. Add the mussels and steam until they open, 2 to 6 minutes. As the mussels open, transfer them to a large dish with a slotted spoon or tongs. Discard any mussels that don’t open. 2. When the mussels are cool enough to handle, open each mussel and remove the upper shell. Using the tip of the shell, loosen the meat meat but leave it on the lower shell. 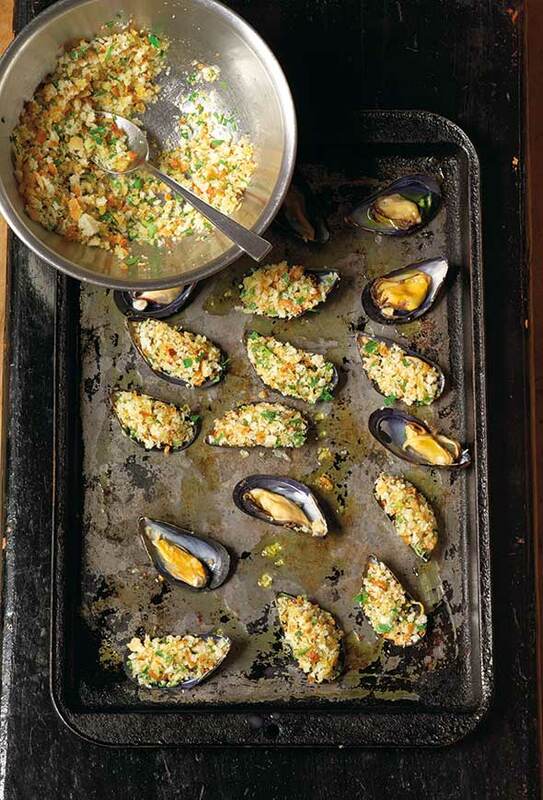 Place the mussels in the lower shell on a rimmed baking sheet. Reserve the upper shells. Preheat the broiler. 3. In a medium bowl, combine the bread crumbs, minced parsley leaves, garlic, olive oil, and salt and pepper to taste. Sprinkle the bread crumb mixture over the mussel meat in each shell. Drizzle the lemon juice over the mussels. 4. Broil until the bread crumbs brown, 1 to 2 minutes. Don’t walk away! The bread crumbs burn easily. Serve immediately, either with tiny forks or with the reserved mussel shells to use as a scooping device. You can easily substitute clams or oysters for the mussels. My tasters loved these mussels. They absorb a tremendous amount of flavor from the court bouillon. I originally thought that 4 pounds of mussels for 4 people as an appetizer was a bit much, but I can assure you that my six tasters (which included a seven-year-old and a 91-year-old) would have gladly eaten more had there been more. Each mussel is a small, highly flavorful bite, so eating 15 or more mussels is no problem. If you're a fan of stuffed clams, then you'll love these stuffed broiled mussels. The garlicky bread stuffing definitely complements the briny meat of the mussel. They (almost) fed 4 hungry adults as an appetizer! I found the topping to be a little scant. I would double the topping next time. I've had stuffed mussels in other parts of the world and the top shell is usually left on, you break it off and it is used as a scoop to eat the mussel along with its stuffing. I served mine with tiny forks. We served them with a cold sauvignon blanc. This is a simple and tasty way to prepare mussels. I love weekday suppers you can prepare mostly ahead and finish quickly. This is one of those. We had the mussels as a main course with orzo and steamed asparagus. Since there were only 2 of us, I used 2 pounds mussels and 1 cup each water and wine. Everything else stayed the same. But having said that, the given amount of stuffing was perfect for the 2 dozen mussels—I will double it for the full 4 pounds of mussels. These were good but I think if the crumbs were bound together it would be more juicier and flavorful. To achieve this I would reduce the cooking liquid to 1/4 cup and then add 1 tablespoon heavy cream to the liquid. Next time I'll use 1 cup Ritz cracker crumbs combined with the other ingredients and the liquid and drizzle the broiled mussels with lemon juice and serve. 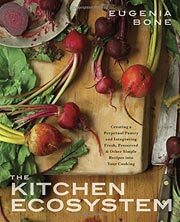 Stuffed Broiled Mussels Recipe © 2014 Eugenia Bone. Photo © 2014 Eugenia Bone. All rights reserved. All recipes and photos used with permission of the publisher.